Well in your defense, you did lose to the eventual compo champion Someone's gotta challenge Amph for his crown! I think I'll have free time in january so I'm definitely joining this! Now I'll have to choose a zone! So...thus begins the after Christmas remixin' smackdown? Who's my first victim? I'm in. Yeah seriously, everyone made awesome mixes! 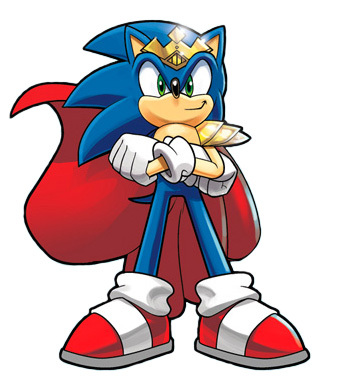 Here's your crown... King Sonic? For now, this thread is serving to announce that the 2014 compo will begin next month, January 2014, to help build awareness and hype. At this time, DO NOT POST PICKS for the compo: the official recruitment period will begin in mid-January when the competition starts. You can make your picks then. I had just been trying to create awareness/interest in the compo at this point and then open up the recruitment for picks on Jan 12th. Then we'd have a 2 week recruitment window before the compo started mixing on Jan 26th. I also wanted to give people time to come back from the holidays and MAGFest and all that jazz too before getting this thing going (hence the Jan 12th date). I'd appreciate it please if no one else started putting down picks for now until the official recruitment period starts up. Thanks! I hope someone does Flying Battery Zone or Oil Ocean Zone this time. Can Hidden Palace (Sonic 2) be used? and really shouldn't be attributed to Hidden Palace zone. From what I've read the Mystic Cave 2P song was originally the song that was supposed to be used for Hidden Palace before it was scrapped anyway. So unfortunately that unused track from Sonic 2 couldn't be used as a pick for this compo, since it is not affiliated with any real zone. Oh man I am looking forward to listening to this, I loved every mix from the first one like dang they were amazing. I'm sure this one will be just as great!
. It's the only one I'll choose! Oh. I didn't know that. That was the only reason I asked about Hidden Palace was cause I thought the unused track was for it. Its too bad. Lol at the video description though. I am busy as hell, but F it. Count me in. Just to update everyone: like it says in the first post, I'll open up the official sign-up on the weekend of January 11th. So everyone can begin posting their Top 5 Zone Picks at that time. I'll give everyone the heads-up in this thread too when the time comes. By my unofficial count, it looks like we have about 16 people that have said they are definitely interested and another 10 or so that I know might sign up. So we should be well on our way to getting 32 participants when I official open up the sign-up! Yeeeeeeaaaah... I'm not gonna do that, it'd take waaay too long You guys can check out the Sonic Wiki page though cause they list all the zones by game, so you can look it up that way. When I open up the sign-up though, I'll keep an up-to-date Google Spreadsheet people can view to see everyone's picks (to make it easy to track and make your own picks) and then when each person's picks are solidified I'll keep a spreadsheet with links to themes so the participants can easily reference each others sources like I did last time. So does The Doomsday Zone count as a normal stage or a special stage? While it does have the "Zone" moniker, it is really more of a final boss stage, and not really a traditional zone, so I'd say no it's not eligible. I didn't allow it last time for the reason. As soon as Mag is over I'm going to attempt to figure out what's wrong with my computer, so count me in but don't be surprised if I have to bow out due to technical difficulties. So now I am really excited for this compo now as I've grown to appreciate the fine music that the Blue Hedgehog games have produced over the years. I have my fingers crossed for someone picking the Sandopolis act zones and a return of the Aquarium Park as I'm really fond of those tracks. Cheers for the potential of more excellent mixes!